Did you ever notice that everybody on TV and in the movies always has perfectly straight, blindingly white teeth? There’s a reason for that. Actors and actresses need to look their best because so many people are watching their every move. And when their images are blown up onto the big screen, their smiles literally can be 30-feet high. So it’s in their professional best interest to have flawless teeth. The reality, however, is that most people don’t have perfect smiles, including movie stars and the actors on your favorite TV shows. Genetics, your oral health habits, the types of foods you eat, and other factors can make your teeth less than perfect. But the difference between famous stars and most ordinary people is the quality of their dental work and the services they receive. Crooked teeth can be straightened with orthodontics. Broken or chipped teeth can be capped. And stained or off-white teeth can be cleaned and bleached so they are white. But how can you get a million dollar, 10,000-megawatt smile if you weren’t born with perfect teeth? The answer is cosmetic dentistry. While most people visit the dentist to get regular checkups or to address problems like tooth pain, cavities or chipped or broken teeth, other people go to the dentist for cosmetic services. Specially trained dentists can transform imperfect teeth into perfect smiles that look amazing even when they are 30 feet high on the silver screen. You don’t have to be a celebrity to have perfect teeth. McCosh Family Dentistry offers both traditional dentistry and cosmetic dentistry for your whole family. 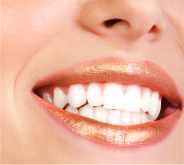 Ask us about veneers, teeth whitening, and other cosmetic dental services. So even if you weren’t born with your favorite star’s smile, don’t worry: They probably weren’t either! Let Dr. McCosh and her team at McCosh Family Dentistry make you look like you should be in the movies.